1. How do I schedule getting on the agenda with the Board of County Commissioners? The Commissioners have set in place a hierarchy of departments to assist you with your question more quickly and efficiently than waiting for a time on the agenda. Should you not reach resolution with our Directors and fellow Elected Officials, you can Contact Beth Luther (303)679-2312 to schedule with either the County Administrator or the Board of Commissioners. 2. How do I request a copy of meeting minutes or cd of a past Commissioner hearing? Meeting minutes and recordings of the meetings are written/recorded for "Action" items on the agenda only. Most of the minutes are located online on the County Commissioners' webpage,http://www.co.clear-creek.co.us/Archive.aspx?AMID=38. Minutes take some time to complete as the Board requires copious minutes. Contact Beth Luther at 303-679-2312 or bluther@co.clear-creek.co.us if you do not see what you are looking for. 3. How do I request copies of Clear Creek County Public Records? Easy if you click the link below it will open a copy in a new window. 4. How do I obtain a copy of the Public records request form? It is easy if you click the link below it will open up a copy of the Public Records Request form. 5. Where is the Table of contents for the county's public records policy? Below is a link to the table of contents for the public records policy. 1. How do I obtain an air quality permit for open burning? 2. How do I obtain an open burn permit from Clear Creek Fire Authority? 3. How do I obtain an open burn permit from Evergreen Fire District? 1. Minimum Insurance coverage requested is $1.1M in the RFQ, but shows $2M in the sample contract. Which is correct? The minimum coverage for both commercial general liability and comprehensive automobile liability is $1.1M combined single limit per occurrence. The actual contract will also indicate $1.1M, not $2M. 2. How closely must the trail corridor as flagged be followed? The main trail corridor and optional trail feature lines are flagged, some areas marked better than others. The corridor is approximately 100ft wide, but variations can be requested by the contractor at anytime during the design or build phases. 3. Where can the contractor camp during the trail build? Temporary camping will be allowed during trail build operations at the top of Floyd Hill Open Space in the flat area where the dirt maint. road adjoins the segment 4 trailhead at the top of the hill. Appropriate 4x4 vehicles can make it to this location with equipment. RV / Sprinter Van camping will also be allowed in the parking lot at the lower trailhead. 4. When is the escorted site visit? 1. How can I submit my application and resume? Under the tab" I Want to . . .", click on "Find Clear Creek County Jobs", and click on the "Clear Creek County Jobs Available" link. This will take you to all open jobs within the County. Choose the job you are interested in applying for and that will take you to the job and the link for the application. If you wish to see the job description, click on the link "Full Description" which us under each open job before you go to the link for your specific job interest and applying. You will be able to attach your resume and all required documents within the application area. Sheriff's Office Jobs typically require additional documents that must be filled out and attached to the application. Your application cannot be considered without those documents being filled out and signed by you, the applicant. 3. Will you take an application even if there are no job openings? Applications can be entered through Online application, but the link is only available when there is a job opening. 4. How long do applications stay on file? Online applications will be kept in the system up to six months. 5. When is Benefit Open Enrollment? Our Benefit Open Enrollment is normally sometime during the first two weeks in November of each year. The benefits start on January 1 of the following year. This is actually a zoning question, since the zoning of a property will determine what uses are allowed. The Zoning Specialist can be reached at 303-679-2363. 2. Can I build a cabin with no power, water or heat? All dwellings must meet the minimum code requirements, which include light, heat, ventilation, kitchen, bath facilities, etc. These requirements can be found in Chapter 3 of the 2015 International Residential Code. 3. How small or large a residence can I build? The Code has minimum requirements for residences, which include minimum room sizes and dimensions. The requirements can be found in Chapter 3 of the 2015 International Residential Code. 5. What work does not require a permit? 6. Does the building permit cover all of the construction? The building permits issued by Clear Creek County will include all of the plumbing, mechanical and framing for the construction described in the permit but does not include the electrical work, which is regulated, permitted and inspected by the State Electrical Department, www.dora.state.co.us/electrical or 303-894-2300. 7. How long is my building permit good for? The permits for new construction, additions and remodels are good for 2 years. The mechanical, re-roof, re-siding and residential repair permits are issued for a term of 6 months. 8. How much will my building permit cost? The building permit fee is determined by the size and scope of the proposed construction and is calculated when the permit is being processed. Please contact the Plans Examiner at 303-679-2343 if you need an estimate of this fee. 9. What do I need to have completed for a Certificate of Occupancy? The construction must be complete and all other associated permits such as the driveway, defensible space, septic permits and the electrical permit must also be finaled. 10. Are contractors required to get a Clear Creek County license? Clear Creek County does not require a county license for general contractors. Property owners are encouraged to get references and check with agencies such as the Better Business Bureau for background on any contractor they are considering hiring. The State requires all Plumbing and Electrical Contractors be licensed through the State. 11. What are the code requirements for my re-roof? 12. Can I, as the property owner, act as the contractor? Property owners are allowed to act as the contractor for their own residence but if a subcontractor is hired for the plumbing or electrical installation, that subcontractor must hold a license from the State of Colorado. 13. What is my snow load? 14. What is my wind load? 1. I am looking at a piece of property and want to make sure it is buildable. Various departments within the Community Development Division can help you answer this question. First, be sure you have the physical address of the property or the legal description or parcel number or Assessor’s “R” number. The name of the current owner could also facilitate your research. Then our Planning Department planning@co.clear-creek.co.us can assist you in determining if the zoning is appropriate for your proposed use. The next question you will want to explore is the legal and physical access to the property. Our Site Development Department sitedev@co.clear-creek.co.us can assist you in this determination, but you may need to engage a title insurance company for a definitive answer. Site Development personnel can also help you analyze site characteristics that will influence the ease or difficulty of developing the site. One more aspect to explore is how you will provide water and sanitation on the site. Our Environmental Health Department eh@co.clear-creek.co.us can assist you with analyzing this issue. 2. My parcel of land is in the middle of nowhere in the mountains and all I want to do is build a basic camping cabin. Why do I have to have a water supply, sewer, a bathroom and a kitchen? Because Clear Creek County is so close to the Denver metro area, it is a popular location for both full-time residents and those who want a weekend cabin. Our development pattern has shown us that weekend cabins inevitably get increased use, often evolving to full-time residences. In order to protect the health of the cabin users and neighboring property owners, we require living conditions that are protective of individual and public health. 3. How do I find out if there is legal access to a specific property? If the subdivision plat and/or survey of the parcel do not clearly demonstrate access, title research is needed. Title insurance companies that operate in Clear Creek County can be found using an online search. 4. I am looking for a map of a specific property. What maps are available? Maps of properties in Clear Creek County are available online through our Mapping Department mapping@co.clear-creek.co.us. This can be a good place to start your research, but be aware that the online maps are not survey accurate. If the property you are researching has been surveyed, and the survey has been recorded with the County Clerk, you may be able to acquire a copy through their office clerk@co.clear-creek.co.us. 5. Can I capture runoff from my downspouts in a rain barrel? 6. Can I put a shed on my property to store equipment or camping gear before I decide to build? Generally speaking, this use is not allowed in Clear Creek County. However, a discussion with our Planning Department staff planning@co.clear-creek.co.us may help you explore possibilities relating to your specific site and intentions. 7. Can I park my RV and/or camp on my property? If you own vacant land in Clear Creek County you may camp on that land for limited periods of times with a permit from the Planning Department planning@co.clear-creek.co.us. You will be required to give assurance that an approved sanitation facility is available at all times. 8. Why does the county have all of these land use rules? Why can’t I just do what I want with my property? Federal and state land use laws and regulations aside, the County has established land use regulations to protect the public health, safety and welfare. Our regulations are also based upon the desire of its citizens to manage growth and development in a responsible manner. Clear Creek County established zoning districts in 1964, followed in subsequent years by Subdivision Regulations and a County Master Plan. These documents went through lengthy public processes that provided public input and guidance prior to implementation. The result is policy that provides a balance between the rights and responsibilities of property owners and the needs of our community as a whole. 1. I would like to register a complaint with the county’s Public & Environmental Health Department regarding a public or environmental health hazard or issue. How do I do this? Feel free to call 303-679-2420. You must provide your name, the nature of the complaint and the address where the problem is occurring. Please be aware that anonymous complaints will not be processed, however, the environmental health department will do its best to maintain anonymity of complaintant. If an investigation is made on the complaint, you may be notified of the results. You must submit an OWTS application, an engineering report, a copy of your water supply system, a zoning disclosure form, a construction site sanitation form, and the application fee. These forms can be found on the Clear Creek County website here; or picked up at the Clear Creek County Annex Building, 1111 Rose Street in Georgetown. Forms can be submitted to the County Annex Building 8 am – 4:00 pm Monday through Friday. Environmental health staff is available from 8- 9:30 am Monday through Friday for direct assistance. 3. I need to research septic system information on my property. Where do I begin? Start at the Clear Creek County website, www.co.clear-creek.co.us, and click on County Online Services. Then click on Permit Search and then click on Permit Search. Enter the requested information on your property. A list of permits will appear. Select the “ISDS” or "OWTS" Type for your address. There is information available for site, permit, contact, payment and permit attachments. If you have further questions, you may contact 303-679-2428. 1. How can I find out how a property is zoned? 2. What are the required building setbacks and allowed uses in my zoning district? Setback requirements and uses are based on the zoning district; the County’s Zoning Resolution may be accessed online or by calling (303) 679-2436. Note: Planned Developments (PDs) have specific setback requirements. Hard Copies of the Zoning Resolution may be purchased from the Planning Department for a cost of $16.04 or $20.54 if mailed. 3. Can I subdivide my property into several lots? Please contact the Clear Creek Planning Department (303) 679-2436 for more information. 4. Will subdividing change my property tax status? It is likely that subdividing will change the property tax status of your property. Questions regarding property tax related issues should be directed to the Clear Creek County Assessor’s Office at (303)679-2315. 5. Does the County enforce covenants? Clear Creek County does not enforce private covenants. Covenants are typically administered and enforced by Homeowners Associations. 6. Can I just deed property to my children without going through the subdivision process? In the State of Colorado, properties of less than 35 acres in size may not be created without approval of the local government. Executing a deed for a property under 35 acres in size without gaining approval from the local government can result in that property being considered an illegal subdivision. Clear Creek County will not issue permits of any type for illegally subdivided properties. 7. How do I determine where my property boundaries are? If your property is part of a previously platted subdivision or division, there will be a plat on file with the Clerk and Recorders Office at (303)679-2340. These plats may be viewed by the public during business hours and will show the location of the surveyor’s pins which mark the property boundaries. Property owners may also look for these pins on their property to determine existing property boundaries. If not previously recorded plats exist and no pins can be found, property owners may choose to have their property surveyed by a Professional Land Surveyor. A recreational vehicle within the County for a period of two (2) weeks from the time such recreational vehicle first arrives in the County, provided that during such time sanitary facilities are available at all times to the occupants of the recreational vehicle. For additional information, please contact the Planning Department at (303) 679-2436. 10. How can I learn more about camping in Clear Creek County? 11. Can I leave my recreational vehicle on my property year around? No, vacant land in Clear Creek County must remain vacant until a principal permitted use is established of a special use is obtained. The storage of one (1) unoccupied recreational vehicle is allowed as an accessory use to an existing legal Permitted Principal Use. 12. Can I put a mobile home on my property? No. According to Section 3, Clear Creek County does not allow a mobile home to be used as a principal or accessory building in any zone district except for Mobile Home zone districts. 13. Can I have animals, small livestock, and large livestock including horses? Possibly, see Section 1007 of the Zoning Regulations. 14. What can I do when someone trashes their property with incomplete, extensively damaged, or unlicensed vehicles, and Junk? 15. How can I obtain a copy of the Clear Creek County Land Use Regulations? You can come into our office in Georgetown to purchase a complete copy for $16:04, request a copy to be mailed to you for $20.54, request a CD copy for $10, or request a few pages of specified information to be faxed, mailed, or emailed. 16. Can I live on my property during the construction of my primary residence? You must obtain a Special Use Permit for living quarters prior to placing the recreational vehicle on the property from the Planning Department. 17. Can I build a storage shed (accessory structure) on my property if it is vacant land, and if so, do I need a building permit? No. Clear Creek County does not allow accessory structures without a principal permitted use or a special use permit from the Planning Department. 18. Can I build a storage shed (accessory structure) on my property if I have a house, and if so, do I need a building permit? If the property is less than an acre the accessory structure is limited to less than 120 square feet, unless a variance is obtained. An accessory structure must always meet the current setbacks associated with your zone district. Any accessory structure over 120 square feet must obtain a building permit. Please note: An accessory structure may not be occupied as a dwelling. Even though the accessory structure may or may not need a building permit. 19. Are tiny homes allowed in Clear Creek County? 1. What are the requirements for submitting a "Driveway and Building Site Excavation" application? A single page application, which provides necessary information, must be filled out completely and signed by the applicant. This is submitted to the Planning Department along with an engineered site plan that illustrates property lines, driveway and building site locations, dimensions and grades, off-site erosion control mitigation, and any other pertinent site characteristics. A zoning disclosure form is also required to be submitted at this time. In-office hours for the Site Development Administrator are Monday – Friday 8:00 am – 9:30 am. Please expect a minimum 2-3 week review time window for driveway permit applications. 2. What is the cost of a driveway permit? Driveway Permits are reviewed by an outside consultant and will be charged the full fee that is charged by the consultant, plus a 5% administrative fee. Defensible Space Permits are reviewed in-house and cost $150. 3. When are these permits required? New building construction or additions that are over 400 square feet in area, or new driveway excavations require compliance with the permitting process. Driveway permits are required for existing driveways, unless a previous finalized driveway permit, signed and dated after January 1989, has been issued. Defensible space inspections are required for new construction and additions greater than 400 square feet. Floodplain requirements are necessary if the construction occurs in an area indicated as "Zone A" on the F.E.M.A. Flood Insurance Rating Map. Clear Creek County requires the use of Best Management Practices for any soil disturbances. Applicants are to prohibit erosion and sedimentation from occurring off site, during and after construction. This compliance is a requirement for all construction activities, and is included in the Driveway and Building Site Excavation Permit. For any large scale disturbance of 2,500 cubic yards / 20,000 square feet or greater the separate "BMP" permit is required. 3. Where is Clear Creek County located? Clear Creek County is located approximately 35 miles west of Denver--mostly along I-70. 4. What are the County office hours? General Hours for County Offices are 8:30 AM to 4:30 PM, Monday-Friday. Hours may vary for some offices, so please check specific departments. A sales tax license is not required by the County – this is obtained from the State of Colorado Department of Revenue because the Department of Revenue administers and collects Clear Creek County tax. All sales tax and lodging tax collected is remitted to the State and then distributed by the State to the County. To obtain a sales tax license with the State of Colorado or for specific questions about sales tax, visit the Colorado Department of Revenue, www.revenue.state.co.us ,or call 303-238-7378. Clear Creek County Sales Tax rate will increase from 1 to 1.65 percent effective January 1, 2018 on taxable sales in Clear Creek County. In addition, there is a County Lodging Tax rate of 2 percent. Contact the City of Idaho Springs, 303-567-4421, Town of Georgetown, 303-569-2555, the Town of Empire, 303-569-2978, or the Town of Silver Plume, 303-569-2363, for tax rates within their jurisdictions. 1. Where can I find current or historic aerial photos of my property? Clear Creek County has an extensive collection of current and historic aerial photos dating back to 1938. 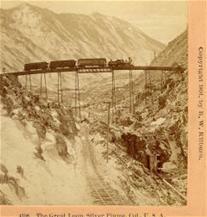 This collection is available online via our Historic Clear Creek interactive map. 2. I want to view a property in Clear Creek County. 3. Does the County create custom maps for citizens? 4. How can I acquire digital GIS data? To view GIS data availability and fee's, please follow the link below. 5. Where can I find maps online? Clear Creek County provides several interactive map applications for citizens to browse and obtain various information from. Follow the link below to see what is available. For a list of other map products such as zoning maps, road maps, or Commissioner District maps click link below. You can also obtain printed versions of these maps at the Annex Building located at 1111 Rose St. in Georgetown. 1. In the event of a county-wide pubic health emergency, how are we informed? Any county-wide public health emergency will be posted on this county web site in the "Alert" category. You can also hear about it in the local media (Clear Creek Courant or KYGT Radio Station). In the event of an immediate threat, the Sheriff's Department uses the reverse 911 calling system. Be sure you are registered. If you have any question or need more general information call the Public and Environmental Health Department at 303-670-7544. 2. What should I do if my water or sewer pipes are frozen and it could pose a health hazard for my family? First call your water provider if you are not on a private well. Then call Environmental Health at 303-679-2335 to get more information about what you can do in your particular situation. 3. What should I do if I suspect I am sick from a food-borne illness? Symptoms from a food-borne illnesses can take anywhere from two hours to two weeks to occur. If you suspect food poisoning, immediately contact Clear Creek County Public & Environmental Health at 303-679-2335 to provide information on the foods eaten. You may be asked to provide a food history to insure that the illness was not obtained from another source. You should also contact your doctor to run tests to determine if you contracted a specific disease. 4. Who should I contact to report a suspected outbreak from a communicable disease? 5. I’ve been bitten and sickened by an insect or animal bite. Who do I call to report it? Contact the Division of Wildlife (303-297-7123) or the Clear Creek County Animal Control Unit (303-679-2398) to capture the animal so that it may be tested for rabies. Only detain the animal if you can do so without further injury to yourself. Immediately wash the wound with warm soapy water and seek medical attention. Contact Clear Creek County Public & Environmental Health for further instructions at 303-679-2335. 1. I was (or my pet was) bitten by a wild animal. What should I do? Contact the Division of Wildlife (303-297-7123) or the Clear Creek County Animal Control Unit (303-679-2398) to capture the animal so that it may be tested for rabies. Only detain the animal if you can do so without further injury to yourself. Immediately wash the wound with warm soapy water and seek medical attention. Keep pets and children away from sick or dead animals. Do not dispose of a dead animal because it may need to be tested for disease. Contact Clear Creek County Public and Environmental Health for further instructions at 303-679-2335. 1. I have become ill and suspect food poisoning from a restaurant. What should I do? Symptoms from a food-borne illness can take anywhere from two hours to two weeks to months to occur. If you suspect food poisoning, immediatly contact us at 303-679-2335 to provide information on the foods consumed. You may be asked to provide a food history to ensure that the illness was not obtained from another source. We strongly suggest you contact your doctor to run tests to determine if you contracted a specific disease, as this greatly aids in the investigation. 2. I would like to start a retail food business. Where do I begin? In order to open a retail food business in Clear Creek County, you must notify the Environmental Health Department of the proposed location of your business. After that the steps are as follows: Fill out a plan review packet available on-line or at the County Annex Bldg. and apply for a retail or mobile food establsihment license. Rules and regulations for both retail and mobile establishments can be found here. 1. How do I get a permit for a septic system? (Onsite Wastewater Sewage Treatment System or OWTS)? You must submit an OWTS application, an engineering report, a copy of your water supply system, a zoning disclosure form, a construction site sanitation form, and the application fee. The forms can be found here; or can be picked up at the County Annex Bldg. in Georgetown. Forms are submitted at the Annex 8-4 p.m., Mon. - Fri. Envrionmental health staff is available from 8 a.m. - 9:30 a.m. Mon. - Fri. if you need direct assistance. For more information contact the Environmental Health staff at 303-679-2335 or 2420. 2. I need to research septic system information on my property. Where do I begin? You may contact the Environmental Health Department at 303-679-2420 or click on County Online Services for a Permit Search. Enter the requested information on your property. A list of permits will appear. Select the "OWTS" type for your address. In this document is information for site, permit, contact, payment and permit attachments. 1. Where can I get my well water tested? 1. What is a cure amount? 2. Who can file an Intent to Cure? The only parties legally allowed to file an Intent to Cure include but are not limited to property owners, persons liable, grantor of evidence of debt and junior lien holders. An Intent to Cure must be filed at least fifteen days prior to the scheduled date of the Public Trustee sale. 3. What is a Redemption Amount? A redemption amount is the amount necessary to pay off the Deed of Trust in default. The Public Trustee's foreclosure files do not contain these figures unless an Intent to Redeem has been filed. The figures are requested and received from the foreclosing attorney for the lender or the over-bidder at the time of the sale. 4. Who can file an Intent to Redeem? The only parties legally allowed to file and Intent to Redeem are junior lien holders as defined in 38-38-100.3 (11). Please consult your legal advisor for advice on any lien you may have. 5. How does Bankruptcy affect a foreclosure? 1. Can I bring my unused paint or stain to the Transfer Station? We are now a PaintCare drop off location, we can accept Latex based paints, Oil based paints and stains free of charge year round. 2. What days are you opened and what are the hours? We are opened Tuesday through Saturday 8 a.m. to 5 p.m.
3. Are you closed for lunch? No, we are not closed for lunch. 4. What is Household Hazardous Waste? Do I have any in my home? Why do these products need to be disposed of properly? Please refer to the link called "HHW Facts" on the left side of our page; it contains information on what Household Hazardous Waste is and how to dispose of it. 5. Can I bring my used motor oil and antifreeze for disposal? Yes, There is a small fee for disposal. Slash is any wood product removed from trees or bushes to do fire mitigation around your home and property. Please view our link on the left side of the web page for pricing. Remember all loads must be covered. 7. Is Compost available to the Public? Yes, for a fee. Check the link on the left for pricing. 8. How do I dispose of noxious weeds? The Transfer Station will accept noxious weeds year round for free. Noxious weeds must be bagged and placed in our compactor bin. If you have questions on what weeds are noxious, visit the Public Works web page on the Clear Creek County web site and view the noxious weeds listing. 9. Do you accept large loads? Yes, large loads are accepted, household (kitchen trash) and rubble must be separated. Remember all loads must be covered regardless of content or will be charged double the applicable fee. 10. What is the difference between "Household" trash and "Rubble"? Not all trash is considered "Household" trash. "Household" trash will come from your kitchen and bathroom. Other trash from moving, clean-up, construction and furniture is "Rubble". These items are disposed of in a different area of the Transfer Station. 11. Why do my loads need to be covered? We ask for all loads to be covered regardless of content. We like to be considerate to our neighbors and not have trash and debris flying out of vehicles onto their property or onto roadways. We will charge double the applicable fee for un-covered loads. 12. Why do I need to separate my plastics for recycle? Plastics must be separated by number and placed in the appropriate bins. The different plastics are recycled for different purposes. Our vendors pay us for products that are separated by type. 13. Why do my recyclables need to be rinsed? Food containers, if left un-rinsed will become moldy and smelly. The Transfer Station staff physically handles all recyclables. Un-rinsed containers could pose a health risk to the staff as well as invite vermin. 1. Can I pay taxes online? Property Tax Notices are mailed by the end of January to the owner of record, as their name and mailing address are listed on the Tax Roll. Failure to receive a property tax statement does not exempt the taxpayer from timely payment of taxes due. You have the option of making One (1) Full tax payment OR two (2) half payments. First Half Payments are due: Last day of February Second Half Payments due: June 15th OR Full payment due April 30th. If you have not received a tax notice by February 1st, please contact the Treasurer's Office. 3. What if I am late paying my taxes? By state statute, there is a 1% late fee charged for each month the property taxes are late. You should receive a delinquent notice in July. Delinquent taxes will be advertised in the local paper during Sept. / October for three weeks. Taxes that remain unpaid are subject to sale at the property tax lien sale which is generally held the first week in November. Note: There are additional fees added to your tax bill if your property is advertised and goes to tax lien sale. You may print prior years property tax payment receipts from the Treasurer's Page. Receipts beginning with the 2012 tax year are available to you online. You are able to check tax amounts, print a tax notice or tax receipt online. Credit Card payments may be made online. Please know your account number and the EXACT AMOUNT DUE. Tax Lien Payments and Endorsements may NOT be made online. There will be a Convenience fee of $0.75 + 2.25% per transaction. Call 303-679-2353. 6. Do you send a tax notice to my mortgage company? NO. We will send upon request by the mortgage company or a tax service. But, you could make a copy and send to your mortgage company. 7. How are the taxes determined on my property?